Blog Quick Quotes: Clear Scraps Cross Promo Day 4! Clear Scraps Cross Promo Day 4! Greetings and welcome to day four of our cross promotion with Clear Scraps! We have a special treat today, two designers on the blog to share their projects with you, Kathi and LeeAnn. 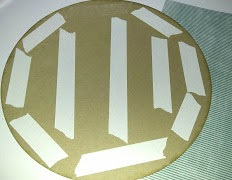 Kathi here to share with you my design for the Clear Scraps blog hop, I enjoyed working with the clear scraps chipboard. I choose the heart. For the love the sea where my adventure started in Florida boarding the Royal Caribbean setting sail for the beautiful Caribbean. We had a great party abroad the ship, photo on the left, my roommate is pictured on the right. Yumi is from Japan. With the chipboard heart I used two of the 2017 PowderPuff Chalking Inks, Bora Bora and Terra Cotta. Close up of the quotes and phases overlaid with the twine netting. The frame was colored with Bora Bora PowderPuff Chalk Ink. I used a die cut anchor cut from a scrap of the Adventure Awaits patterned paper cascading from the Petaloo flowers and leaves. Bora Bora PowderPuff Chalk Ink distresses the anchor and the seahorse die cut. A die cut octopus is towering over the small sea shells and Petaloo flowers. The octopus was distressed with Terra Cotta PowderPuff Chalk Ink. Greetings crafty friends. 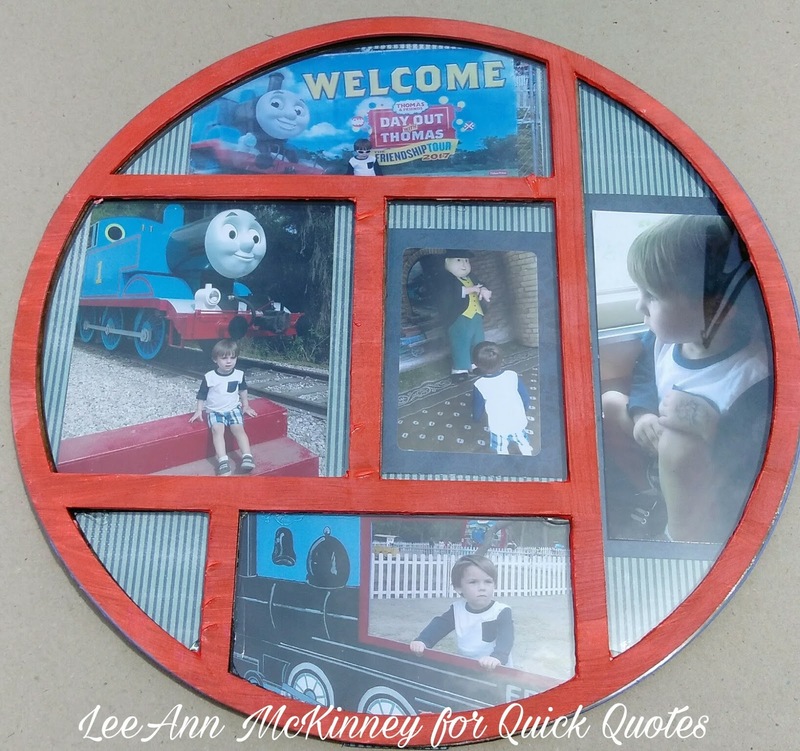 LeeAnn here to share with you my project for today featuring Clear Scraps 12x12 Circle Printer Tray Frame along with Quick Quotes papers. Let me say as soon as I saw this in the box, I knew exactly what photos I was using. 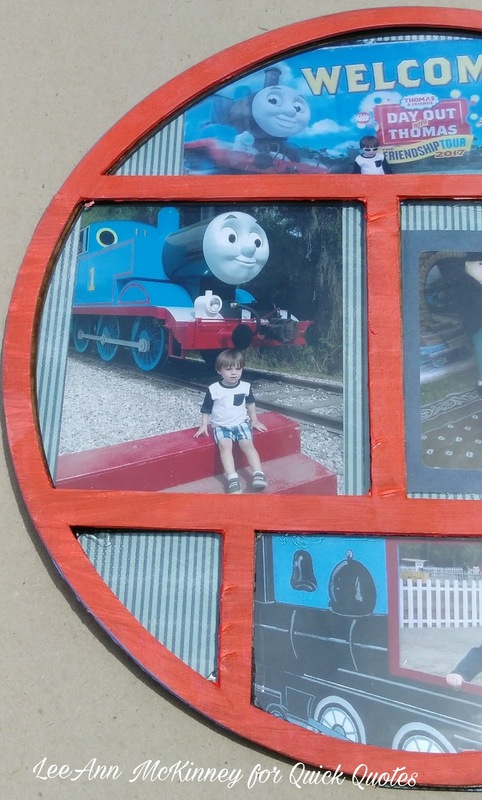 Just a few days before my project box arrived, my daughter took my little grandson to the local Day Out with Thomas and the Friendship Tour. Little man LOVES Thomas, almost as much as he loves monster trucks, and he looked so happy that day. It was really hard to pick which photos to use, but with the help of my Selphy CP1200 printer, I was able to print not only 4x6 photos but also a 2x3 sticker for the center rectangle. 3. 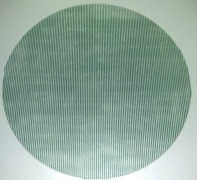 I removed the protector off the double stick tape and smoothed out my paper from the Adventure Awaits Paper Pack. I then put the rest of the frame together, which was 2 chipboard frame layers, 1 acrylic layer and one more chipboard frame layer on top, carefully making sure they all lined up. For my first layer, I used PowderPuff Chalk Ink in Lipstick to build the color Red. I didn't get it quite as vibrant as I wanted, so I decided to experiment. 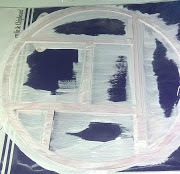 I covered the top layer with a good smattering of Gesso. Once fully dry I covered with Lipstick PowderPuff Chalk Ink again. 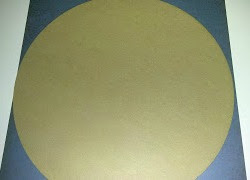 When that was dry, I used Beacon 3-in-1 Glue to affix all layers together. I can't wait to see this in my grandson's room. 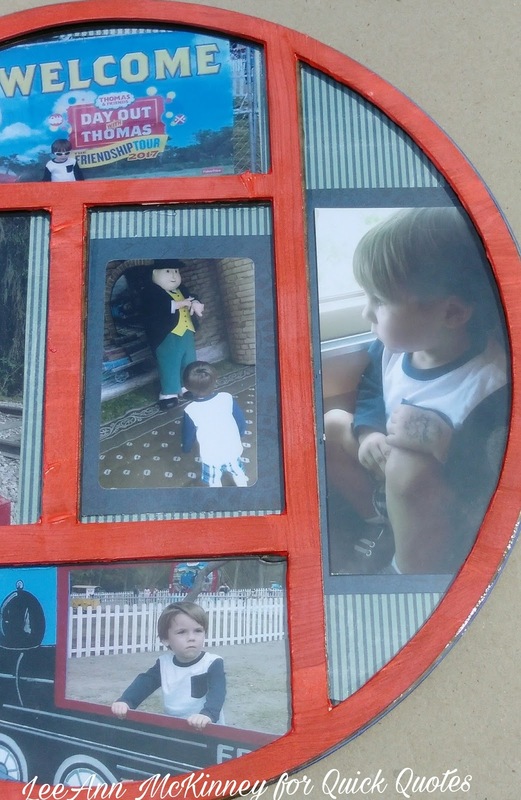 I will be purchasing some of these frames in the future from Clear Scraps, as they are fun and quite easy to work with! I hope you have enjoyed our Clear Scraps inspiration today. Please be sure to stop on over to the Clear Scraps Blog today to check out their fabulous projects and make sure you say hello from Quick Quotes! I'll be back in a couple weeks with my next project, thanks so much for stopping on over! Simply delightful! Loving these trays! So many wonderful details! Great projects Kathi and Lee Ann! I love the different shapes of the Printer Tray Frames. 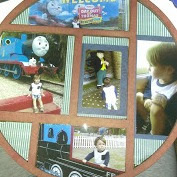 Love the cruise theme AND the train theme!